Last week, when I made this chive meatloaf, I made double. I rolled and froze the second batch, and took it out last night for a quick dinner. I baked it in our convection oven on the self-timer early in the day, around 3 pm. But I also had mashed potatoes left over, and so when the meatloaf had cooked and cooled, I molded the potatoe into a little igloo over the loaf. I used my hands. Then, I suddenly remembered something from my childhood. Cheese in mashed potatoes ? Cheese on twice-baked potatoes? I quickly dumped some grated cheddar and monterey jack all over the potatoes, then baked everything at 350 degrees for 2-25 minutes. The cheese crust turned golden and slightly crispy, and the kids were a little baffled, but then they tasted it and thought it was one of the best things ever. Finn ate two helpings and Ella just kept saying, “These potatoes are so good.” And she’s not much of a potato eater. Really, it’s the definition of comfort food, and it made for a very happy, easy dinner. 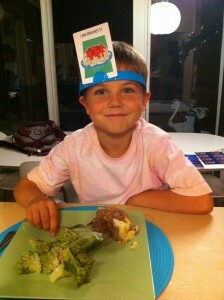 In fact, the only thing more fun for the kids than this, which they thought was a totally new meal, was playing Finn’s new game, “Who Am I?” while they ate. In this case, he is most definitely not what he is eating.